Within minutes walk from the archaeological site lie the three museums of Olympia that unfold the history of the sanctuary of Zeus and its celebrated games: the Archaeological Museum, the Museum of the Ancient Olympic Games and the Museum of the History of the Excavations at Olympia. The oldest of the three, the Archaeological Museum was founded in the 19th century to house the finds that the excavations in Olympia constantly brought to light. However, as a growing wealth of artifacts kept accumulating, even after a century-long archaeological research, and due to the high seismicity of the area, it became apparent that the elegant 19th-century building would not suffice. The new museum of Olympia was designed by Patroklos Karantinos, it was built in the decade 1966-1975 and was officially opened in 1982, since then it underwent a major reorganization of its exhibition areas in 2004, in view of the Olympic Games held in Athens. Today, the museum's permanent collections cross 12 halls and over 3,500 years of history, from around the 3rd millennium BC when humans first settled in Olympia to the twilight of Zeus' sanctuary in the 7th century AD. 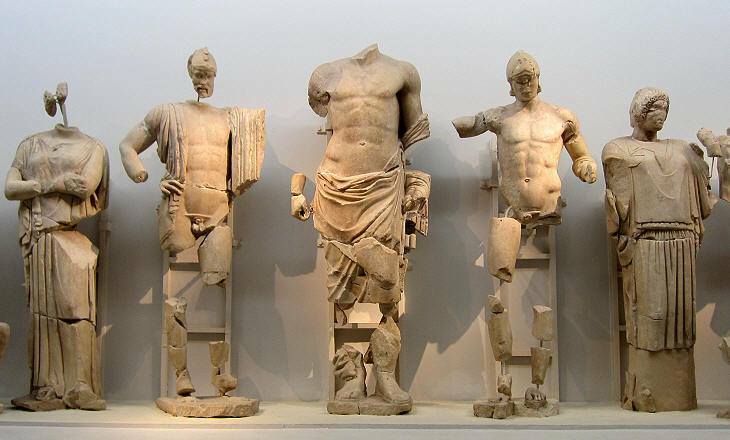 Renowned for its sculptures and for its collection of ancient Greek bronzes, which is the richest in the world, it goes without saying that the Archaeological Museum of Olympia ranks among the most important museums in Greece. More than 14,000 bronze artifacts were preserved buried in the soil of Olympia, by far the largest number ever found in a region of the ancient Hellenic world. Human and animal figurines constitute a popular category of those metal works, dating back as early as in the 9th century BC. They often depict warriors, charioteers and, of course, athletes such as the mid-6th century BC statuette of a discus thrower or the early-5th century statuette of a runner. An impressive group of the museum exhibits comprise the large bronze cauldrons, often decorated with griffins or sirens, imaginary and daemonic beings inspired by the Orient. Those were luxury offerings to the sanctuary manifesting the prosperity and artistic level that Archaic Greece had reached by the 7th and 6th centuries BC. Apart from pilgrims and Olympic winners, warriors returning victorious from battlefields expressed their gratitude to Zeus by donating their weapons. 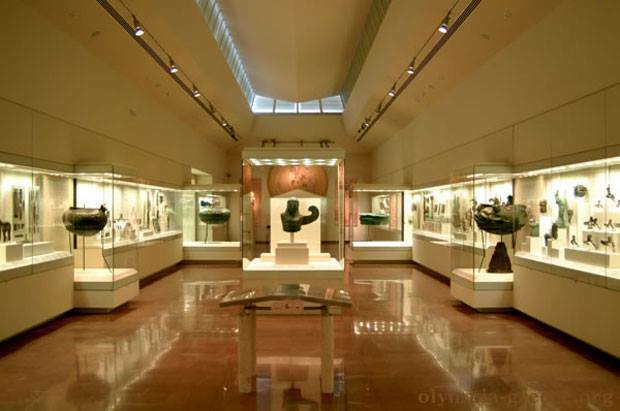 Thus, Olympia turned out to be a repository of ancient Greek weaponry with a long series of helmets, shields, cuirasses, spears and other parts of armour recovered from the site and now on display in the museum. Of immense historical significance is the helmet of the Athenian General Miltiades, the winner of the battle of Marathon against the Persians (490 BC). A unique example of ancient war instrument is a battering ram of the 5th century BC. 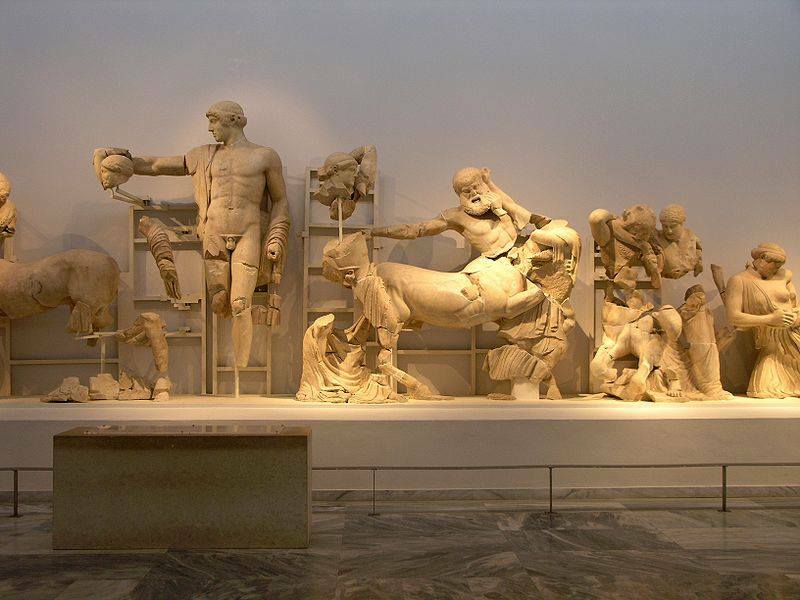 The Museum of Olympia houses masterpieces of classical art such as the sculptures of Zeus' temple and two celebrated works of Graeco-Roman antiquity, the statues of Nike by Paeonios and Hermes by Praxiteles. The temple of Zeus dominated the sanctuary not only due to its size but also due to its magnificently decorated pediments and metopes. The centauromachy scene with the emblematic figure of Apollo and the Labours of Hercules are considered the finest sculptures of the so-called Austere Style of the 5th century BC. No later than 420 BC, Paeonios created his winged goddess Nike, the statue that became synonymous with the iconographic allegory of Victory and has shaped its representations in western art ever since: the statue of Nike is the one featured on the Olympic medals from 1896 to date. Around 330 BC, the great master Praxiteles sculpted Hermes carrying the infant god Dionysus. This is one of the few superb original statues of the 4th century that survived, as the most celebrated works of this period are known to us solely through their Roman copies. When the priests of Olympia decided that the temple of Zeus needed a new cult statue, Pheidias was the very man to be sought for. The artist whose sculptures upon the Acropolis had left Athenians open mouthed settled in his purpose-built workshop in Olympia and by 430 BC he delivered the colossal gold-and-ivory statue of Zeus, which would be listed among the Seven Wonders of the ancient world. Both the chryselephantine Zeus and its counterpart statue of Athena in the Parthenon vanished in the Middle Ages, however Pheidias' workshop was discovered during the excavations at Olympia and its contents are on display in a special hall of the Archaeological Museum. Raw material residues, tools, jewels and casts offer a behind-the-scenes glimpse into the sanctum of a leading ancient Greek sculptor who took the trouble to sign his personal cup, inscribing upon the base "I belong to Pheidias"; another unique exhibit at the Museum of Olympia. The collections are displayed in a modern way. 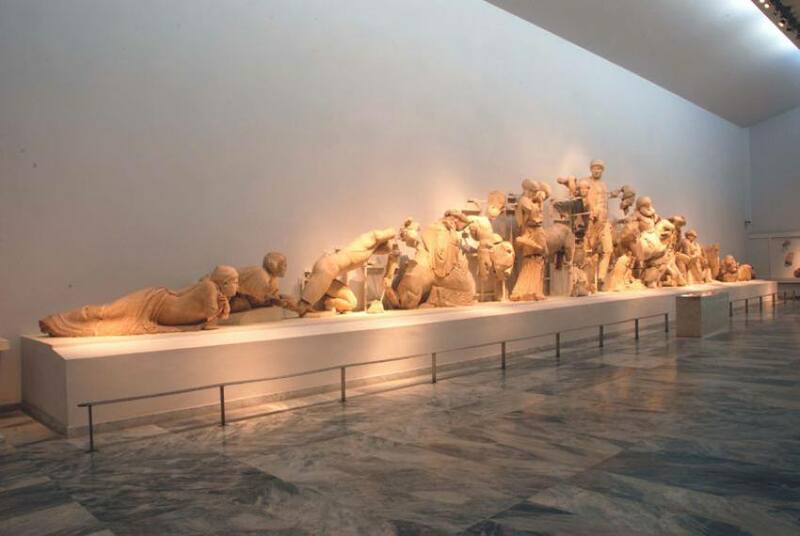 A chronological order, easy to understand information panels and subtle lighting, make visiting a museum in Ancient Olympia an enjoyable family event.